Data gathered during the piloting is used to optimize the design of the customer’s ultimate system. Tests are conducted for confidential evaluation, but are often observed by national and local regulators, at customer discretion. Tri-Flow installations cover a wide range of air flows and pollutants.These systems have an operating history of more than eight years, during which time they have demonstrated exceptional high uptime performance, and required very little maintenance. Tri-Flow pilots are fully instrumented and automated. They are self-contained, including a portable testing lab. The unit can be transported to the customer site and commissioned within a few hours. It has a small footprint for ease of locating and easily interfaces with plant utilities. Effective, fully documented pilot testing can be accomplished quickly – often within a few weeks. Tri-Flow has a MERV 16 performance rating, and provides efficiencies of 99.999% on 0.5 micron and larger particles by weight. Tri-Flow filters have a multi-year service life, and are easy to maintain thanks to integral pulse jet cleaning. 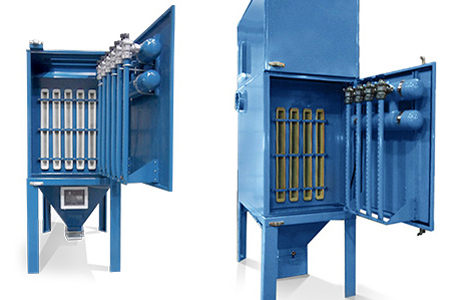 Tri-Flow filter elements are manufactured in several formats and are tailored to the application.